Yellowstone, the world's first national park, sparked the bright beginning of a public lands legacy nearly 150 years ago, and it has remained a crown jewel of the U.S. national park system ever since. The effort to set aside and protect land from excessive development and resource extraction was the original embodiment of "America's best idea," a popular phrase adapted from a quote by writer Wallace Stegner. This idea was in large part inspired by Yellowstone itself. Designated in 1872, the park came long before the National Park Service was even established. The congressional act to protect Yellowstone under President Ulysses S. Grant came only two years after the first official expedition into the area. Tales of what explorers found impressed the American people and their legislators so deeply that they knew this place deserved protection, even before an institution or strategy for doing so had been fully conceived. A series of volunteer superintendents oversaw the park at first, but continued pressure from illegal loggers, squatters, and poachers prompted turnover of control to the U.S. Army for a number of years. The difficulties and inconsistencies of management in this and subsequently established national parks elucidated the need for a coordinated administrative system, so another act of Congress created the National Park Service within the Department of the Interior in 1916. As remote as Yellowstone is today, in the far northwest corner of the Lower 48's least-densely populated state, it was much harder to reach a century ago, and for a while cars where not even allowed into the park. People still got here though--by train, wagon, horseback, and foot--just to see the natural wonders made famous nationwide by paintings and stories. These include the iconic geyser called Old Faithful, which erupts in a fountain of boiling water 180 feet high once every 45 to 125 minutes. It's not quite clockwork, but it is consistent and dramatic enough to attract spectators continuously since the 1870s. Other famous features are the rainbow-ringed hot waters of Grand Prismatic Spring, abundant roadside wildlife like bison and elk, and a waterfall-filled canyon with steep golden walls that are the namesake of the river and the region: Yellowstone. 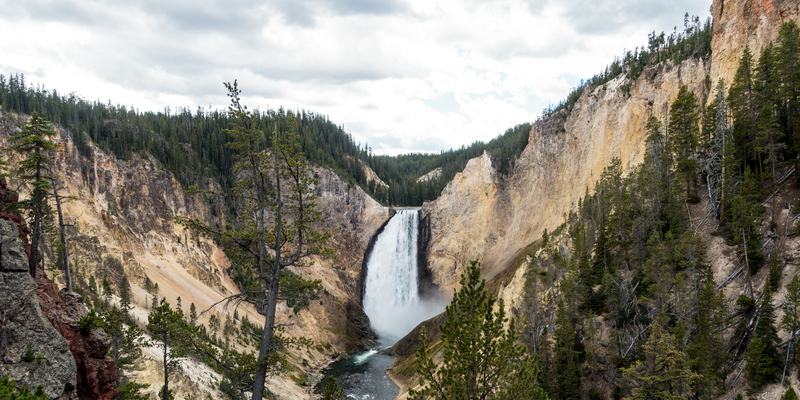 These bucket-list sights are what have made Yellowstone internationally famous, but this park is huge and diverse, with far more too see and do. It is, in fact, the second largest national park in the Lower 48 (behind Death Valley National Park), and though there are more than 300 miles of pavement, roads fall far short of reaching every part of the park. Approximately 1,000 miles of hiking trails provide access to the rest. The healthy mix of roadside and remote destinations along with the sheer size of Yellowstone offers an abundance of activities for all levels and abilities, far more than anyone could ever accomplish in one visit or most likely even a lifetime. In order to make the most out of your trip, this guide breaks down logistics by describing highlight destinations organized by park region, along with short descriptions and links to detailed information on each. Use the map below for reference. This is still a mere sample of everything Yellowstone has to offer, but it should aid in finding some of the best adventures and discovering more for yourself. On the rim of the Grand Canyon of the Yellowstone River. Photo by Denis LeBlanc. 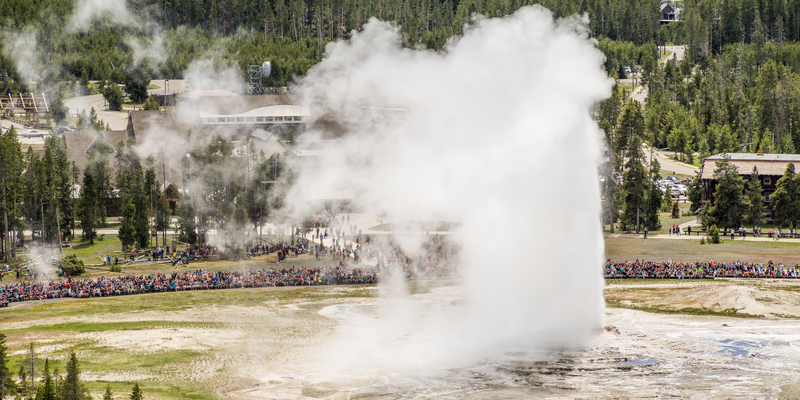 Within the park are more than 500 active geysers, which is more than half of the geysers known in the entire world. 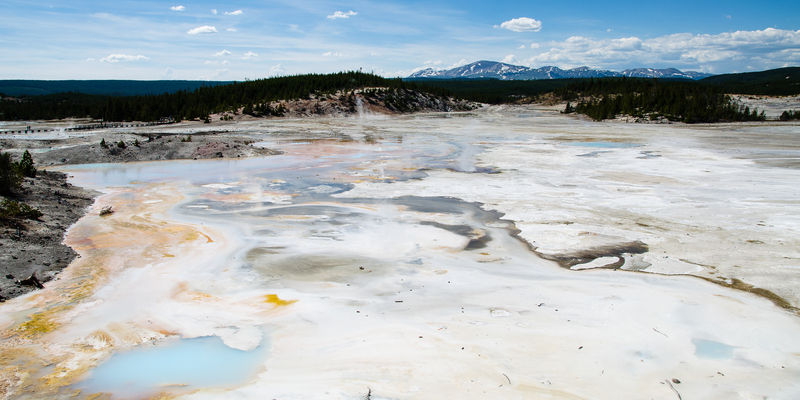 Yellowstone is, in every sense of the word, a hotspot for geological activity. The abundant and diverse hydrothermal features, along with the complex formation history of the landscape, have attracted much study over the years. Geologists have determined that the geysers, hot springs, and other warm water features are driven by volcanic heat. A large magma chamber lies deep below the surface. This is a literal hot spot in the earth's crust, an especially large one called a supervolcano that has produced massive eruptions far in the past. The huge lakes, basalt cliffs, and thermal features of Yellowstone are remnants of overlapping calderas, or volcanic craters, left over from previous eruptions. Though the area remains highly geothermally active, scientists see no evidence that the supervolcano will erupt again anytime soon. Cycling the Grand Loop. Photo by Stephanie Keene. The roads through Yellowstone form what is known as the Grand Loop, which is really a figure eight comprised of two smaller loops. Most of the visitor centers, lodging, campgrounds, and highlight destinations are located along this loop The park's five entrances are distant from each other and connected only by spur roads from the Grand Loop. Circumnavigating the loop takes four to seven hours in driving time alone, so don't expect to do it all in one day and have time for much hiking or sightseeing out of the car. Cycling the Grand Loop is a unique way to travel, but it is not recommended during summer because of high auto traffic and a lack of safe shoulders. During spring and fall, however, certain sections close to cars, allowing amazing opportunities for both day rides and bike tours. Pallate Springs. Photo by Robyn Anderson. Boiling River Hot Springs: Short hike to riverside thermal springs that you can soak in. 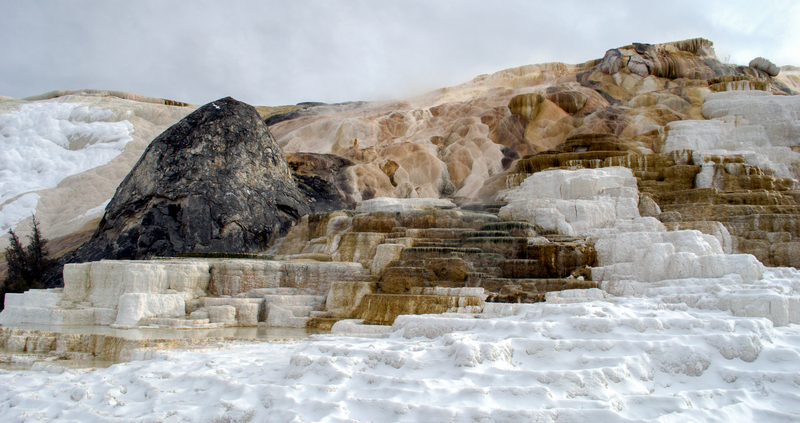 Mammoth Hot Springs: Large and photogenic thermal complex with many features and viewpoints. Visit Upper Terrance for a unique angle. Undine Falls: View this tall and tiered cascade from the road or hike through the broad Gardiner Canyon to reach it. Or take a short hike from the road to Wraith Falls a bit upstream. Rescue Creek: This 8-mile point-to-point hike is provides great opportunities to spot wildlife along with views of Sephulcher Mountain and the Absarokas. Beaver Ponds Loop: Pleasant day hike with great scenery including Sepulcher Mountain and the Liberty Cap hot spring cone. Sepulcher Mountain: Long, tough hike to gain one of the area's most prominent summits. Crescent Lake: Use the Specimen Ridge Trail to hike into this isolated and beautiful backcountry lake. The Hoodoos: Hike to an interesting geological site where oddly shaped rocks formed by mineral springs are strewn across a hillside. Bunsen Peak: Popular uphill hike to commanding views over the whole Mammoth area. Stunning views along the Agate Creek hike. Photo by Stephanie Keene. Forces of the Northern Range Trail: Self-guided nature trail along a boardwalk with signs that teach about the geology and ecology of Yellowstone. Yellowstone River Picnic Trail: A hike near the rim of the Black Canyon of the Yellowstone that links thermal features, canyon views, open woodlands, and wide meadows with a good chance of seeing wildlife. Black Canyon of the Yellowstone: This deep river canyon is hardly detectable until you are staring right into it. The hike is rich with geology and wildlife, and it is best done as an overnight backpacking trip. Lost Lake Loop: Easy but uncrowded hike through forest and meadows to the shore of a secluded lake. 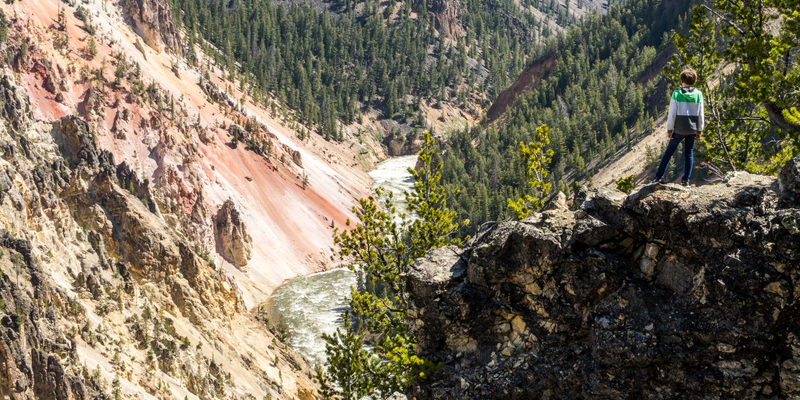 Agate Creek: Condenses some of Yellowstone's best scenery into one long day hike or moderate overnight. Specimen Ridge Trail: One of the best backcountry hikes in the park, this route crosses high peaks and flowing rivers in remote terrain. Tower Fall Trail: Short walk to an overlook at one of the park's most famous waterfalls. Lamar Valley: One of the best places in the park to spot wildlife from the road, including wolves. Bliss Pass: Bliss Pass is a great day hike, and several backcountry sites make this an excellent overnight trip as well. Wildflowers in the summer are a highlight. The view from Lower Lookout Point. Photo by Kevin Murray. Mount Washburn: This is a panoramic summit with a lookout tower near the center of the park. 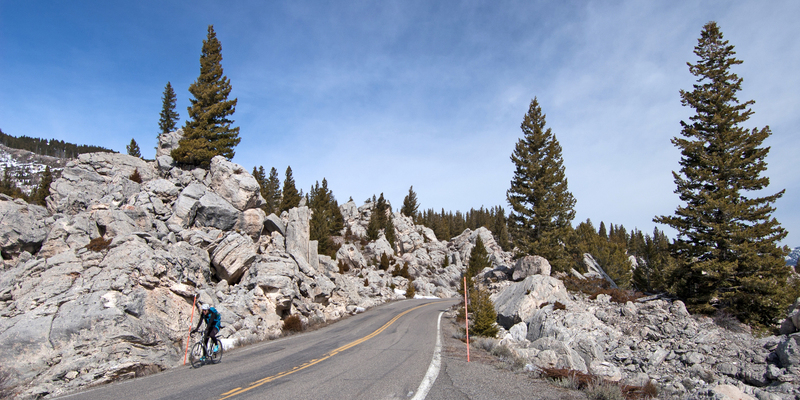 Hike or bike to it on Chittenden Road, or on foot via Dunraven Pass or Glacial Boulder Trailhead. Cascade Lake Trail: Easy hike through wet meadows with a good chance of seeing wildlife. Grand Canyon of the Yellowstone: The bright-colored walls of this 1,000-foot-deep gorge are what gave the river and the national park their names. The canyon also produces Yellowstone's most impressive waterfalls. Don't miss out on a view from Lookout Point, Artist Point, Brink of Upper Falls, Brink of Lower Falls, or Ribbon Lake Trail. The view from Storm Point. Photo by Jessica Hart. Mud Volcano: Bubbling "pots" and "cauldrons" are literally boiling the ground in this recently exposed thermal area. A boardwalk makes it easy to admire from a safe distance. Pelican Creek Trail: Short nature loop with gorgeous views on the shore of Yellowstone Lake. 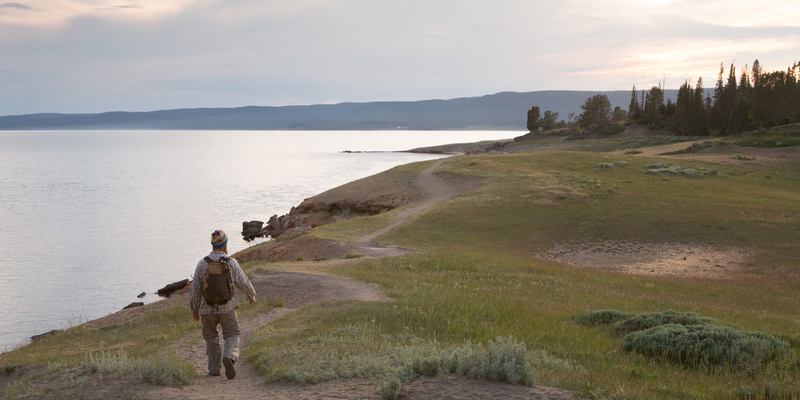 Storm Point: This short hike not only reaches huge views over Yellowstone Lake, but it packs in wildlife, thermal features, meadows, and forest along the way. 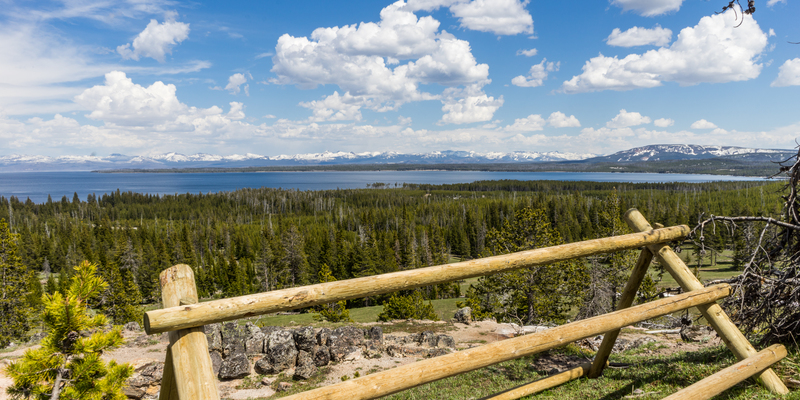 Lake Butte Overlook: Drive-up overlook with a panorama of Yellowstone Lake with the Tetons as a backdrop. Great for sunsets. Yellowstone Lake from the Lake Overlook. Photo by Denis LeBlanc. West Thumb Geyser Basin: Huge geyser area that packs in a lot of thermal features, including some that bubble up beneath the water of Yellowstone Lake. 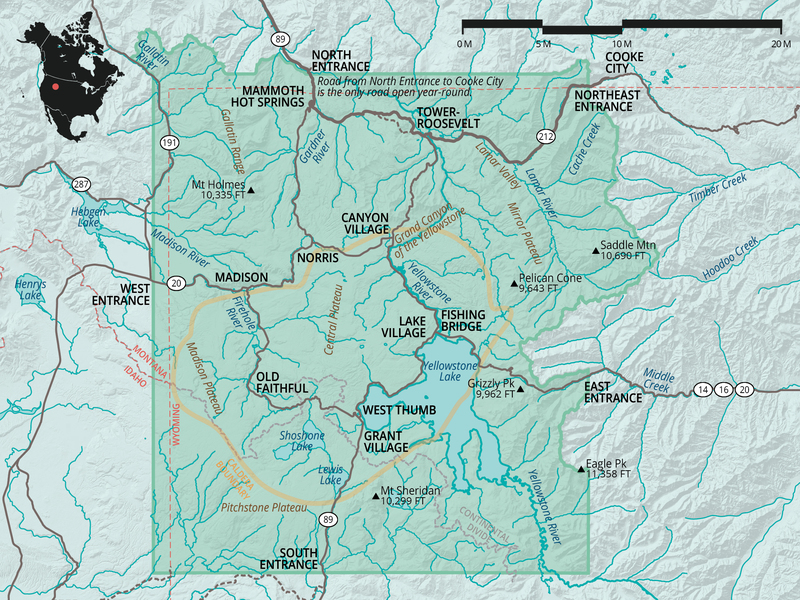 Lewis Lake to Shoshone Lake Loop: In the Lewis River area closer to Yellowstone's south entrance, you can trek to the largest backcountry lake in the Lower 48. Old Faithful from Observation Point. Photo by Denis LeBlanc. Old Faithful: The world's most famous geyser, Old Faithful is the main attraction that has drawn people to Yellowstone for generations. Upper Geyser Basin Trail: An easy loop travels through one of Yellowstone's highest concentrations of thermal features in the area that includes Old Faithful. Black Sand Basin: With Emerald Pool, Cliff Geyser, and potentially lighter crowds, this small basin is worth the stop. Biscuit Basin: Another concentrated thermal area with colorful pools, streams, and a few small geysers. There is also an easy bonus hike to Mystic Falls further off the beaten path. Firehole Meadows: A backcountry trek connecting Upper and Lower Geyser Basins with alpine meadows, waterfalls, and wildlife along the way. Fairy Falls: Day hike to a tall waterfall that also features many colorful thermal pools among the hills. Grand Prismatic Spring: This is the largest hot spring in the United States, but it is most famous for its rainbow colors produced by microorganisms living in the water. Many other pools and springs are concentrated here in the Midway Geyser Basin. View them from the easy boardwalk near the road, or hike to a more impressive vantage from the Grand Prismatic Spring Overlook. Firehole Lake: Explore this beautiful area of geysers, colored creeks, and bubbling pools on a boardwalk or a scenic drive. Lower Geyser Basin: An easy boardwalk is the best way to tour this area, which features the bubbling mud of Fountain Paint Pot and also some very active geysers. Lone Star Geyser Hike: While the eruption times may be a little unpredictable, the hike in is fabulous, and the crowds are minimal compared to Old Faithful. Porcelain Basin. Photo by Louis Otis. Firehole Canyon: Scenic drive in the canyon of the Firehole River with views of waterfalls, solidified lava flows, and access to a swimming hole with a small beach. Harlequin Lake: Short, easy hike to a tranquil lake filled with lilly pads. Gibbon Falls: Roadside overlook of a large and impressive waterfall on the Gibbon River. Artist Paintpots: Short hike around colorful boiling mud pools with some great overlooks. Norris Geyser Basin: An especially dynamic thermal area with pools, pots, and geysers along a boardwalk and forested hiking trails. Hiking the Sky Rim Trail. Photo by Stephanie Keene. Bacon Rind Creek: Streamside stroll through a meadow in a less-visited corner of the park. Big Horn Peak: Long, steep climb to huge views atop the highest point on the Sky Rim Trail. 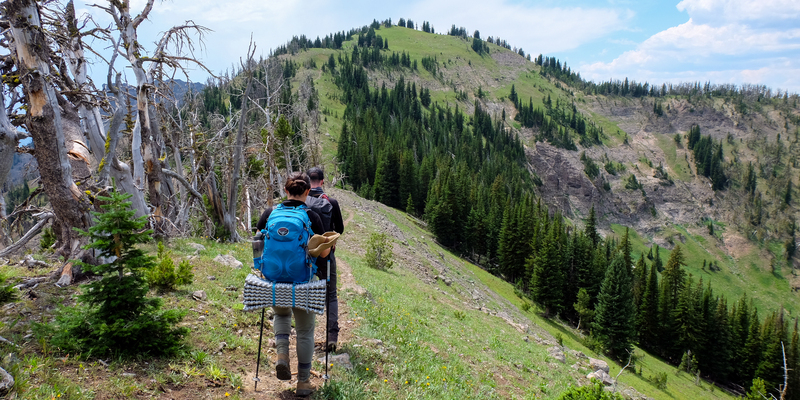 Sky Rim Trail: One of the park's best backcountry treks, this multi-day route traverses the park's northwest boundary following a ridgeline and topping tall summits. Bison in the Lamar Valley. Photo by Denis LeBlanc. Yellowstone is renowned for its wildlife more than anything else, besides maybe Old Faithful. 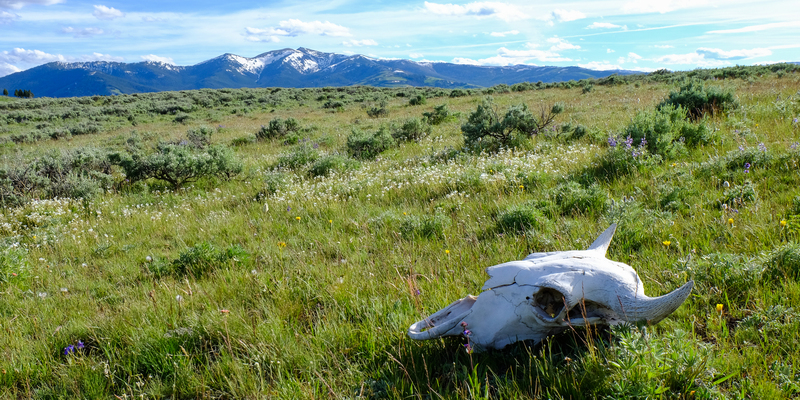 Even in the early age of European settlement, when megafauna roamed the West throughout, the herds of Yellowstone were noticeably healthier and more numerous, which in part inspired its preservation as a national park from the very beginning. In fact, Yellowstone boasts the highest concentration of large mammal species of anywhere in the country today. 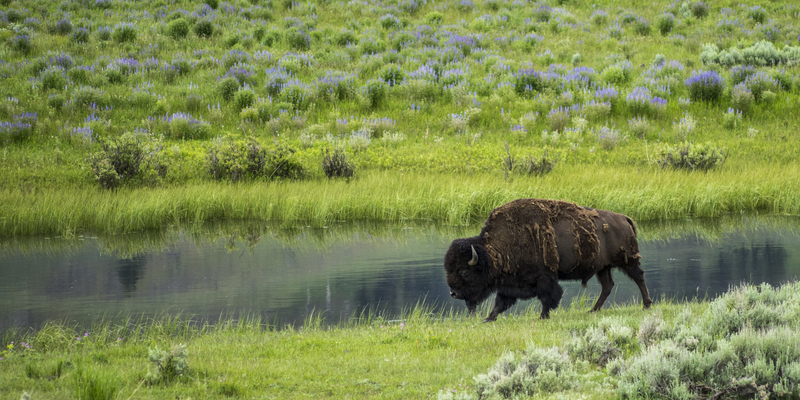 Presently, Yellowstone is one of the last strongholds for wild bison in the United States. These are generally easy to find near (or right in the middle of!) roads in many parts of the park. The region is also home to an isolated but healthy population of grizzly bears as well as gray wolves, which were once extirpated but were then reintroduced in the 1990s. You would be lucky to spot one of these top predators, which generally stay away from people. You are likely to see elk, mule deer, black bears, coyotes, and maybe pronghorn antelope in the meadows or bighorn sheep in the hills. Other residents that are harder to find are moose, mountain goats, badgers, river otters, beavers, marmots, martens, wolverines, foxes, bobcats, lynxes, and mountain lions. There are also 285 species of birds documented in the park, including majestic species like bald eagle, osprey, peregrine falcon, trumpeter swan, and sandhill crane. Here are some suggestions for places to spot wildlife, especially the large mammals. Visit in the early morning or evening for your best chance of seeing them. Safety: Yellowstone National Park is not a zoo. These are wild animals that can and do hurt people every year. The cause is usually someone getting too close to take a picture. Always remain at least 25 yards away from any large animals, and 100 yards away from large predators. If an animal approaches you, back slowly away and do not make unnecessary loud noises or sudden movements. Park in roadside pullouts to view wildlife from your car. Do not drive off road or block traffic. There are laws in place to protect both people and animals, and getting too close is punishable with a hefty fine. Even if you are farther than the minimum "safe" distance, if any animal, including birds, moves away or is otherwise visibly disturbed by human presence, you are breaking the law. For more information, visit the park's wildlife webpage. Tower Fall Campground. Photo by Denis LeBlanc. Mammoth Campground: Scenic campground in proximity to Albright Visitor Center and Mammoth Hot Springs. Indian Creek Campground: Mid-sized campground in a gorgeous and remote setting, a bit of a drive from the main Mammoth area. Tower Fall Campground: Small and somewhat quaint, but centrally located campground near Tower Junction. Slough Creek Campground: Rustic and out-of-the-way campsites near one of park's best places to spot wolves (still safe for campers). Pebble Creek Campground: Remote campground in Lamar Valley, but closest in-park camping to the Northeast Entrance. Bridge Bay Campground: Large, popular campground that is centrally located and set right on Yellowstone Lake. Fishing Bridge RV Park: The only campground in the park with full hookups is also well-placed in a central location. Lewis Lake Campground: This campground remains open later than many others, making it a great option later in the season. Old Faithful Inn: This grand lodge with a view of the geyser is also a historical landmark. Built in 1904, its rustic style has inspired architecture in other national parks ever since. 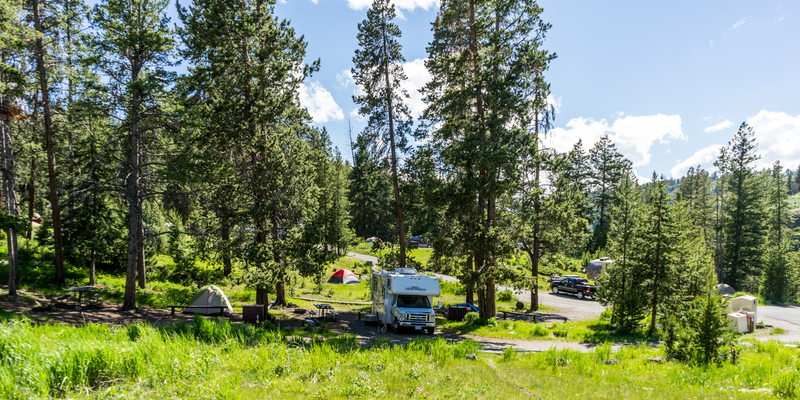 Madison Campground: Close to the geyser basin, this popular campground also accepts reservations. Norris Campground: The Gibbon River flows through this 111-site, first-come, first-served campground, making for great views of the surrounding meadows. Baker's Hole Campground: Located just outside the west bounary, this Forest Service campground is convenient and often less crowded than those inside the park. West Yellowstone Campground: This is the campground near the park's West Entrance. Camping in the Yellowstone backcountry. Photo by Jessica Hart. 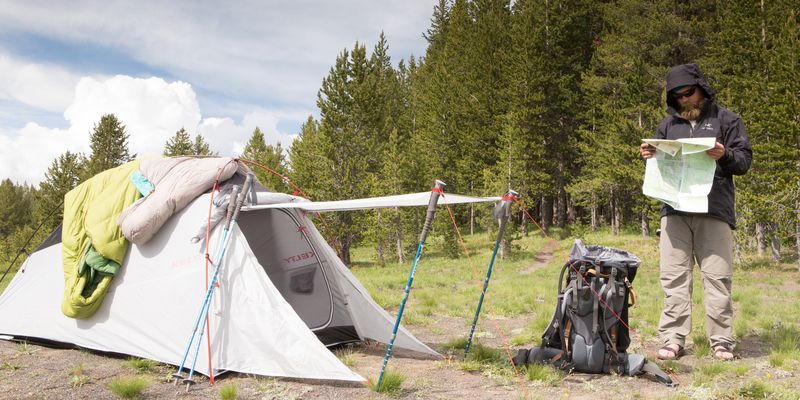 In the vast expanses of Yellowstone's remote terrain, there are more backcountry campsites than nearly any other national park. Based on location and accessibility, they range from nearly always full to hardly ever visited. Some require swift river crossings, others snowy mountain pass crossings, and others can be reached only by boat. The opportunities for adventure and combinations for multi-day trips are endless. Treks into the backcountry require proper experience, planning, equipment, bear safety, and Leave No Trace practices. All overnight trips require a permit, which can either be reserved in advance by mail or in person up to 48 hours before the start of your trip. For more information visit the park's backcountry camping webpage or call the backcountry office at 307.344.7381. Yellowstone is primarily an alpine and subalpine environment, with an average elevation of 8,000 feet above sea level. This means that summer is generally warm while winter is very cold and snowy, but extreme conditions can occur at any time of year. Rain or snow may fall, no matter what month, so be prepared for a variety of weather. Spring: Daytime temperatures up to 60 degrees with overnight lows sometimes well below freezing. Snowfall and wintry mix are common, and winter snow lingers on the ground in some spots well into June. Roads generally open in mid-April and early May to cars. Summer: Daytime highs of up to 80 degrees at lower elevations with overnight temperatures pleasantly cool, though sometimes below freezing at higher elevations. Thunderstorms are prone to popping up in the afternoons during July and August. These can produce dangerous lightning and other extreme weather like hail and wind. Fall: Similar temperatures and weather patterns to springtime, though generally a bit drier. Roads and facilities begin to close in mid October to cars for the winter. Winter: Extreme cold (often subzero temperatures at night) and snow throughout the winter, with yearly average snowfall of 150 inches. Snow covers the ground for the whole season at all but the lowest elevations. Most park entrances, facilities, and roads close in the winter. The North Entrance is the only one open year round. As is the case with other national parks, pets are prohibited in most areas. This includes trails, boardwalks, hotels, and in the backcountry. They are legally allowed in cars, though the realities of the climate in Yellowstone National Park may make this a dangerous option. Pets are allowed within 100 feet of a paved surface such as a road or a parking lot, and they are also allowed in campgrounds. Note, however, that it is imperative to properly store all water and food overnight when camping, and leaving pets unattended outside (i.e. in a tent) is prohibited. There are several pet boarding services surrounding the park in communities like Bozeman, Livingston, Jackson, Cody, and others. First national park. Geysers. Wildlife. Huge backcountry areas. Traffic and overcrowding in some places. Long drive between most features.